I truly believe we are all leaders in our own spheres, whether it is among our families, our communities, or even just as masters of ourselves. 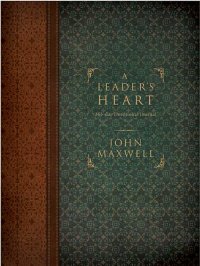 That's why I was so excited to read A Leader's Heart from John Maxwell. I received a free copy from BookSneeze and was so impressed with the quality of the book. It's absolutely beautiful and the first page I opened to gave me something to think about. I have different roles- woman, wife, mother, church leader, and they all must be balanced. Everyone I work with or serve is important and different. Reading through this book and taking the chance to reflect on the ways I can improve as a leader was wonderful. I can't wait to follow through the yearly diary and see how I can be better each day.